This entry was posted on Sunday, February 10th, 2013 at 5:13 pm and is filed under EDCI 506, Teaching Philosophy. You can follow any responses to this entry through the RSS 2.0 feed. Both comments and pings are currently closed. 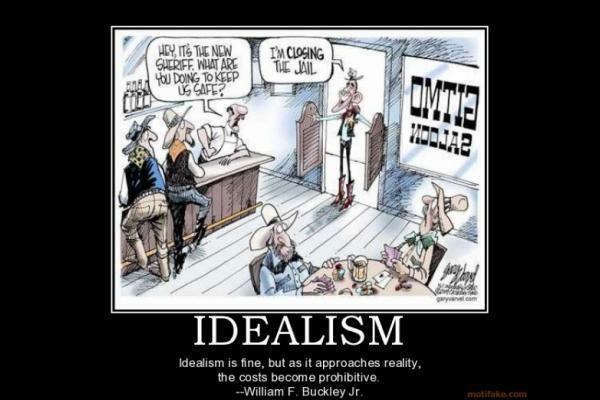 I also would like to use a mix of both idealism and realism in the classroom. I think it’s important to incorporate both because it creates a well-balanced individual, someone who understands and grasps the key concepts but can also apply those concepts to other relatable situations. Your civics lesson example is perfect! I’ll have to check out Maslow’s pyramid of self-actualization – it might help me better understand Emerson’s essay which was a little dense and hard to chew, so to speak, for me. I agree with you – a perfect idealistic classroom is just as ineffectual as a perfect realistic classroom and elements of both will have to be incorporated, regardless of how a teacher relates to either philosophy. I am also with you on the realistic approach and agree that it is more applicable for the 21st century student, teacher and classroom. As a biology teacher, implementing idealistic approaches in my class might prove somewhat more challenging. But I do appreciate that you listed some precise examples of tools you might use. While I feel I am more aligned with Realism rather than Idealism, the one area of a Realist classroom I disliked, was the lack of academic “interruptions” like art and music. I like that you took the time to think about the different aspects of both Realism and Idealism that you would want to incorporate into your future classroom. I especially agree with the point that you wouldn’t want to leave art and music out! I feel that art and music add invaluable lessons to children, and it is equally important to take a break from “traditional learning” every once and awhile to just create.